Founded in 1769, Dartmouth is a member of the Ivy League and consistently ranks among the world’s greatest academic institutions. Dartmouth has forged a singular identity for combining its deep commitment to outstanding undergraduate liberal arts and graduate education with distinguished research and scholarship in the Arts & Sciences and its three leading professional schools—the Geisel School of Medicine, Thayer School of Engineering, and the Tuck School of Business. Dartmouth is a different experience. It’s stepping into the role of researcher; bonding with your professor over coffee; exploring new intellectual frontiers; and thriving in a diverse community. If that sounds like you, then you belong here. We expect you to change the world—and we give you the tools to make it happen. Build the academic program that excites you intellectually: Combine one of more than 50 majors with your pick of minors, fine-tune a major with another discipline, or design a special major around your own passion. After the completion of your DOC trip and Orientation, you will come to know all the lyrics for the Alma Mater, as well as all of the accompanying mini-choreography (‘Lest the old traditions fail! ), sound effects (The hill-winds in their veins), and class-year shout-outs (Their old undying faith). But, it wouldn’t hurt to get a head start. You’ll realize that a humongous percentage of your fellow Dartmouth family has participated in the welcoming DOC first-year trip. When you meet people during your initial weeks at school, many conversations begin with “What trip were you on?” Most trips have reunions throughout the school year and you’ll enjoy running into your trippees around campus as your time at Dartmouth quickly slips by. The Dartmouth Outing Club has the longest standing tradition of first-year outing trips and it is indeed a wonderful custom. You will come to realize that the welcome, acceptance, and bonding that occurs on a DOC trip typifies the full-spirited school unity that defines your Dartmouth experience. It’s a cyclical pattern of communal goodwill – older students welcoming new students who turn into older students who then welcome new students. The spirit that is Dartmouth is passed from generation to generation in this manner. Homecoming is an amazing experience for first-year students. Festivities begin on Wednesday night and continue through until Sunday. There’s a football game and other athletic events. Dartmouth alumni come from far and wide. Your class will complete the building of the bonfire which will be lit the night of the First Year Sweep. The Sweep is nowhere near as frightening as its name denotes. While first-years at other campuses might suffer from all manners of hazing, Dartmouth’s Sweep is the event that demonstrates the excitement the Dartmouth community (current students and alumni) feel about the matriculation of a new class. During the Sweep, all the first-years from all over campus parade from dorm to dorm, collecting more members of their class. You walk through the streets of Hanover and up onto the Green in a huge GREEN mob. Alumni and upperclassmen line your route – cheering for their beloved school and welcoming you to your new community. Old alums unite with first year students as chants of Dartmouth resound all around campus. Everyone gathers around the bonfire and, as it’s lit, the first-years begin their tradition of running in a circular, yet somewhat harried, manner around the mighty flames. Prehistoric? Perhaps…but this is your official introduction to the school at large. For the college on the hill! ‘Lest the old traditions fail! Stand as sister stands by brother! Dare a deed for the old Mother! Greet the world, from the hills, with a hail! Is made part of them till death. After winter term (and the cold beginning to spring), you will be astounded by the number of students that actually attend your school, and flabbergasted further by the sheer number of people outside. Green key is a big party weekend in late spring, and is characterized by a very large number of people OUTSIDE enjoying the spring weather. The weekend starts out with a toga party, a block party on frat row, a lot of free food, bands, and beer. Some people literally start partying after fraternity meetings on Wednesday and don’t stop until Sunday. AD and Theta Delt both have lawn parties – Theta Delt’s is famous for its pig roast, AD’s for its band. The Student Activities Office has food offered on the Green, Student Assembly usually sponsors activities. Green key is basically an action-packed weekend that allows for some hard playing before the final studying push of spring term. Fieldstock is a newer tradition, where each summer, students celebrate their sophomore summers by holding a carnival weekend on the Green, preceded by a week of summer Olympics. The highlight is the chariot race, where students race across the Green in homemade chariots, reliving an old Dartmouth tradition. Still in its infancy, Fieldstock definitely has some room for new ideas and traditions to form. Who knows, maybe you (during sophomore summer) will be the one to come up with the next polar bear swim! Dartmouth, you’ll be part of a close-knit community that’s anchored by campus life. Whether in the undergraduate residence halls or the graduate student apartments near campus, you’re always near friends and faculty. Write for a literary magazine, work on a political cause, play in a musical ensemble, organize a backcountry ski trip. As a Dartmouth student, you’ll have every opportunity to involve yourself in an extraordinarily rich range of student clubs and activities that connect you with the community and with your strengths. As the largest and oldest collegiate outing club in the country, the Dartmouth Outing Club sponsors outdoor recreation and environmental stewardship. Community Service and civic engagement are vital to the Dartmouth experience. Students, faculty, staff, and alumni dedicate their time and talents to make a positive difference locally and around the world. The nickname for Dartmouth’s athletics teams is “The Big Green,” but the College has never had an official mascot. The “Big Green” nickname refers to the color green in use by Dartmouth’s teams since the 1860s. Contrary to what some believe, the Indian was never Dartmouth’s official mascot. There have been a number of student referenda over the years that hoped to determine a mascot; over the years, suggestions have ranged from the Timberwolves to the North Stars to the Moose. In 2003 the campus student humor magazine Jack-O-Lantern created “Keggy,” an anthropomorphic beer keg that occasionally appears at sporting events. But, to date, no mascot has been officially adopted by the College. 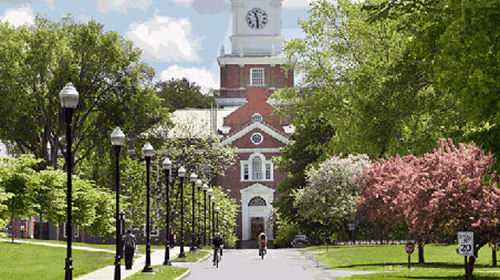 Dartmouth is the smallest school in the Ivy League, with just over 4,000 undergraduates and around 2,000 graduate students. This allows students to learn in small seminars so that they have the opportunity to truly engage with their professors and peers. The learning model is much more active than the traditional lecture hall in which students just sit silently and learn passively. Dartmouth’s NCAA championship-winning ski team has its very own mountain to practice on. The skiway is a mere fifteen minutes away and student tickets are only $15! The skiway’s lodge was recently renovated, so it’s a great day trip for a weekend getaway. (born on March 2, 1904) published his first children’s book, And to Think That I Saw It on Mulberry Street, under the name of Dr. Seuss in 1937 after it had been rejected 27 times. Next came a string of best sellers, including The Cat in the Hat and Green Eggs and Ham. His rhymes and characters are beloved by generations. (born January 13, 1970) is the first African-American woman to create and executive produce a Top 10 network series—the medical drama Grey’s Anatomy. She is also the creator of its spin-off, Private Practice, the political thriller Scandal and the legal whodunit How to Get Away With Murder. Before these series, Rhimes penned such film screenplays as Crossroads and HBO’s Introducing Dorothy Dandridge.